It’s fairly safe to say: this is not your grandmother’s bookclub. Warning: Includes spoilers for My Brilliant Career. As some of you might be aware, the Digital Writers’ Festival kicks off today. One event that might be of interest to romance readers is My Brilliant Bookclub, an online reading/annotation/bookclub-style event: over the course of the festival (November 1 – 11), readers will have the chance to annotate and comment on the text of Miles Franklin’s [ Wiki ] seminal Australian work My Brilliant Career [ BT | Amz | iT ]. This is a chance to explore – or tear apart – the Australian canon from its beginnings. 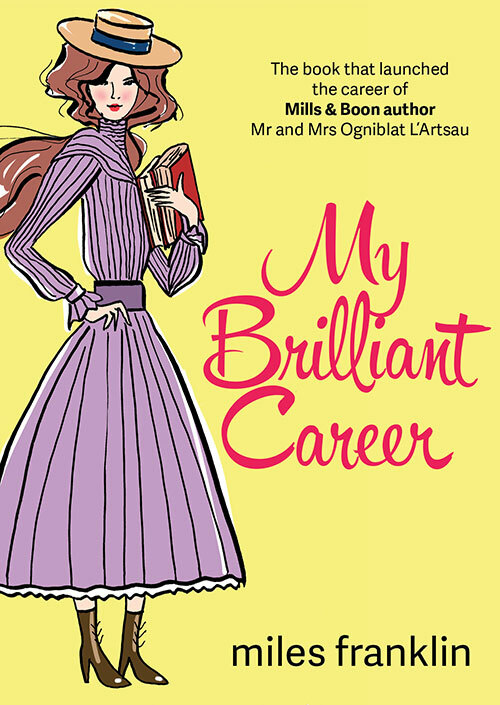 Franklin’s 1901 novel My Brilliant Career is a passionate, fast-paced and often funny protofeminist romance, which depicts rural Australia on the brink of entering a new era of federation. The land is tough, the racism casual, the class system unforgiving, and the gender roles strict – but made for breaking. Fair warning, given that Book Thingo is a fairy-killing space: My Brilliant Career does not have a romance HEA. What it does have, however, is an awesome heroine in Sybylla Melvyn, a smouldering love interest in Harold Beecham, and an ending which is, if not a romantic HEA, one I think we can characterise as optimistic (if we squint, anyway, and pretend that the sequel is not called My Career Goes Bung [ BT | Amz | iT ]). My Brilliant Bookclub is being run by the Digital Writers’ Festival in conjunction with the Stella Prize, so I had a chat with festival director Jane Howard and prize manager Veronica Sullivan about this super-cool sounding project. JM: What was the inspiration behind this project? JH: The project was inspired partially by the work of Leah Finnegan as the News Editor of Genius.com. I first heard of her and the platform on the Longform Podcast, and was immediately excited by what the technology can offer for media criticism, both as a place for serious thought and for levity and fun. When I joined DWF I knew I wanted to use the technology for the festival; it was just a matter of how. Kylie Maslen, who will be kicking off the book club alongside Veronica, responded to our open call for pitches with a want to create a response to a book that worked somehow like the comments on Soundcloud — and all of the pieces clicked together. JM: Why My Brilliant Career? JH: The short answer is it is out of copyright but still in print! But also I knew I wanted to do something Australian, and My Brilliant Career looms so large over the Australian literary landscape we couldn’t have chosen anything else. Like most people, I’d heard so much (and seen the film) but had never read it — and I was curious about what it held. I read the book before we finalised the programming, and I was delighted at what a fun read it is. Then, of course, the Stella Prize has introduced me to so many wonderful authors over the past few years: it made sense for me to discover their namesake, too. JM: My Brilliant Career is a text that kind of casts a long shadow over Australia’s literary culture, with its author’s name enshrined in two of our most well-known literary prizes: the Miles Franklin and the Stella. There’s an obvious tension between these two names, pointing to the masculinity of literary culture: and, of course, Henry Lawson once famously said of My Brilliant Career that he ‘hadn’t read three pages when I saw what you will no doubt see at once — that the story had been written by a girl’. Are some of the gendered aspects of Australian literary culture something you’re hoping to tease out in the annotation process? VS: My Brilliant Career is such a fascinating work to revisit through the lens of contemporary perspectives on gender and literature. Stella Maria Sarah ‘Miles’ Franklin is now widely considered a proto-feminist icon, because she wrote stories that valued the voices of women, especially young women, and because she succeeded in an industry and a culture that was, at the time, hostile to women’s achievements. She was also involved in the early Australian feminist movement, and all of these elements contributed in some way to the decision to name the Stella Prize after her, and in doing so to reclaim her real first name, the female name she felt she had to hide in order for her writing to be taken seriously. 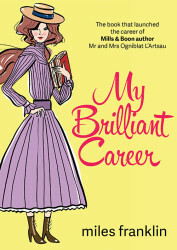 My Brilliant Career is a remarkable book in so many regards. 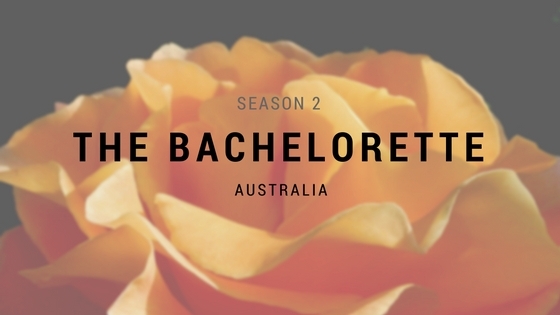 One of the most interesting aspects is that it’s so resolutely tied to the Australian bush, a setting that has thoroughly masculine connotations in our collective cultural consciousness. The book opens up the space of the bush, previously the preserve of male explorers and bushrangers and cattlemen, to women too. For Sybylla Melvyn, the mercurial protagonist of My Brilliant Career, it’s a place that offers her, as a young girl, a great sense of freedom and liberty. So a discussion about gender within the context of the book itself is perhaps inevitable; that discussion is also inextricably bound up with the broader concept of the literary canon, which books it considers to be valuable or significant, and where Stella Miles Franklin fits within it. This is not to say that the book is a radical utopian vision of egalitarianism for all. My Brilliant Career is indelibly marked by the colonialist society in which it was produced. There are massive faults with its treatment of race — every interaction Sybylla has with a non-white person is characterised by ignorance and racism. The characterisation of the few Indigenous Australian characters mentioned is horrifying, if unsurprising. I hope the DWF book club will also enable us to examine the book’s limitations without flinching. JM: I’m fascinated in this tension between femininity and the bush that we see expressed in My Brilliant Career, and it’s something that I think might be being worked through to some extent in genres like rural romance and its cousins in contemporary women’s fiction, which are immensely popular at the moment. Do you have a take on that? Do you think we can position My Brilliant Career as a proto-rural romance? VS: Definitely, I think it can be many things to many different readers, which is partly why it has such enduring appeal. It has so many aspects of the romance genre, particularly period romances — multiple charming and not-so-charming suitors; dramatic shifts in fortune and the opportunity to escape from poverty to a life of privilege; an intense, irresistible physical and mental attraction (between Sybylla and the gorgeous Harold Beecham) that must be concealed beneath the veneer of polite society. It’s been frequently compared to Jane Eyre, which I think is a very astute comparison. But because of its ending, I don’t personally consider My Brilliant Career to be a romance; I think it’s more an affectionate subversion of the form. Ultimately Sybylla is left [SPOILER] penniless and alone, having rejected Harold’s affections and called off their engagement because she can’t believe he would ever be happy in a relationship founded on such an imbalance of power, wealth and attractiveness (she’s obsessed by how plain she is). She ends up back at her family home, basically exactly where she began. My Brilliant Career strikingly balances romance and anti-romance, and I think that’s what Henry Lawson was referring to in his (puke-worthy) introduction: the ‘girlishly emotional parts’ that he dismisses, contrasted with Franklin’s ‘born of the bush’ soul, which he valorises. Franklin is operating within the structures and conventions of the romance genre, even as she playfully dismantles them. VS: I definitely think dedicated romance readers will find plenty to enjoy in My Brilliant Career. There’s so much warmth and wit, and delicious melodrama. It’s playful and utterly compelling. Sybylla’s dynamic with Harold is totally swoon-worthy … if you lop off the book’s final chapters. And certainly, her choice to prioritise her (not-so) brilliant career is really empowering, even if, as you say, we might regret it on her behalf. JM: I just finished teaching a course on canonical literature, and I was struck by the fact that, while many of the texts we generally consider canonical literature are lauded for their timelessness and universality, the Australian canon seems to privilege locality: that is, it needs to be recognisably Australian. Do you have a take on this — and, in broader terms, what do you think the position is of My Brilliant Career in the Australian canon? VS: I think you’re right that our canon does tend to reward books that are quintessentially and identifiably Australian. There are probably lots of reasons for this, but I suspect it could have something to do with the way our national literature developed — out of a settler community that was desperate to differentiate itself from the British culture and government that had authority over it, and consequently to emphasise its distinctive Australianness (through bush settings, local references, emphasis on particularly Australian linguistic phrasing, etc). I wonder if there was also an element of defensiveness or insecurity that bred the early canon, and a reluctance to be seen as in competition with major British, European or American writers. I think those instincts and responses would be true only in the sense of how the canon formed, but it’s possible that they then extended through the ensuing generations of its development, once that tendency had been established as the norm. This is some heavy-handed armchair psychologising I’m inflicting on the early canonical Australian writers, but it’s fascinating to consider. This is also a particularly interesting question in light of Franklin’s stipulation in her bequest of the Miles Franklin Literary Award that the winner must ‘present Australian life in any of its phases’, and how the interpretation of that condition has changed over the course of the prize’s lifespan. In terms of where My Brilliant Career fits within the canon, it’s pretty solidly ensconced there. I think its significance has only increased with time, as Franklin’s legacy has grown even more important to Australian literary culture. To me, it also throws into stark relief the relative dearth of other Australian women of that era who are similarly widely-read and well-regarded. Miles Franklin overcame the odds to become a respected writer, despite her gender. Few other women writers of the late 19th and early 20th century were able to do the same. My Brilliant Career is a reminder of how far we’ve come. JM: Let’s get technical: how is the annotation process going to work? JH: The annotation works very similar to comments on Medium, which people may be more familiar with. You just highlight the text, which allows you to overlay comments on that section of the book. You can then also reply to other people’s annotations, creating threads on particular parts of the book. Discovering how people want to annotate the text is part of the adventure! Our blurb for the project invites people to ‘Be critical, be celebratory, be analytical, be irreverent’ and I think that about covers it — it’s really up to the readers as to where they take it. I’m sure some people will contribute some serious literary and cultural criticism — and some people will find silly gifs to make their point. I think there is room for all things. JM: I love the idea of this being a broad critical space in which commentary can range from very serious literary analysis to the gif. Are you planning on collating and/or curating this project at all after it finishes? Is this analysis going to be recorded or preserved — and if so, how? JH: While the festival runs from the 1st to the 11th of November, that is really only a nominal final date. The beautiful thing about being an online festival is that so much of it stays on after the festival dates are over! The panels will all be online, so anyone can watch them at any time, and it’s the same for the book club — the 11th is, really, only a nominal end date, and the project will stay up on our website after that date so people can look back at what was made, or they can continue to play with it. JM: And finally, a super shallow question: do you have a favourite part of the book? VS: This is such a nerdy choice, but I love the passages where Sybylla is devouring the music and books at her grandmother’s house, and how deeply she relishes the exposure to art that she lacked throughout her childhood, but that some part of her has always craved. And I love the tenderness in her relationship with her aunt. You can participate in My Brilliant Bookclub online. Tagged australian authors, book events, digital writers festival, feminism, miles franklin.